It’s easy to see, after only a few matches in the Dreadnought beta, why people would be quick to compare it to Wargaming’s free-to-play titan, World of Tanks. One might expect Yager’s game of clashing capital ships to have more in common with World of Warplanes, given that most of the action takes place miles above the ground, or World of Warships, since both contain… well, ships. Neither of those games contain the one thing that’s integral to Dreadnought and WoT, however, and that’s cover. 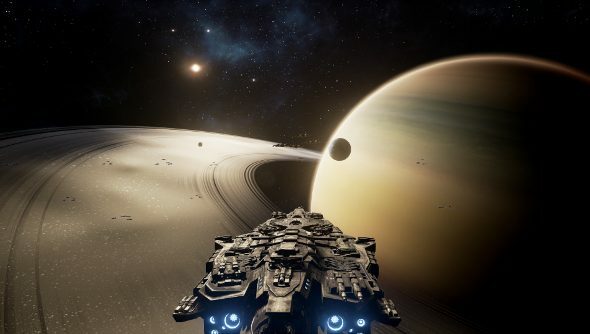 Will Dreadnought earn a spot in our list of the best space games on PC? These are not the Star Wars or Battlestar Galactica-style clashes in open space where nothing but debris and the occasional asteroid belt separates the warring armadas. A fight in Dreadnought is a game of cat and mouse or whack-a-mole, but with lasers and missiles and massive, hulking ships full of death-dealing armaments. My journey to competency started with failure. Terrible, embarrassing failure. My very first match saw me pick a titular Dreadnought, one of the game’s gargantuan, heavily armoured, incredibly slow killing machines. It’s impossible not to feel powerful when commanding one of these behemoths. They look like the sort of ships that could make something explode just by appearing. My Dreadnought exploded in less than a minute. That was certainly one way to deflate a cocky rookie. I looked at the place where my ship had once been in confusion. Was it not big? Was it not menacing? Did it not have loads and loads of guns? Why was that not enough? The answer, of course, was that I merrily sailed out into the open and, being a gigantic target, every single one of the enemy armada opened fire. Dreadnoughts are tough, sure, but not tough enough to take on five other ships, including at least one other Dreadnought. Caution is the name of the game, here. I know what you’re thinking: Captain Kirk wasn’t cautious. Han Solo wasn’t cautious. Certainly, that wasn’t one of their main character traits, but let’s not forget that they both still knew when to hide or flee so they could fight again another day. That’s how Solo met his pal the space slug. It does take some getting used to, though. I mean, you sort of expect your ship to be its own cover. And it feels natural to fly your ship up high, to get a better view of the battle, a vantage point from which it’s easier to pick targets. But sitting out in the open, high up, is an absolutely terrible idea. When I realised just how important cover was, I made my second mistake, and it’s one that I expect a lot of new players will make. Indeed, I’ve seen it happen quite a lot as those with early access to the beta get to grips with the game. Anyway, the mistake! I was too cautious. I hid. A lot. Behind buildings, space stations, asteroids and mountains. There’s nothing wrong with finding a good spot of cover and making the most of it, but when that’s all you’re doing, and when every other player is doing the same thing, battles devolve into these dismal fights where both teams stick to opposite ends of the battlefield, bobbing up and down as they take pot shots before quickly retreating behind something. It’s slow and dull and doesn’t remotely feel like a scrap between two fleets of deadly warships. 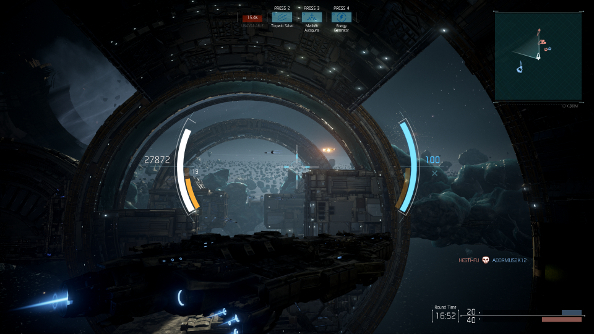 When teams strike a balance between cautiously sticking to cover and making brave charges and sneak attacks, however, Dreadnought becomes a compelling shooter. With warping and stealth cloaks, fights really get interesting. These abilities can be used defensively, teleporting out of combat or hiding in plain sight, but it’s when used aggressively that they become devilishly fun tools. I personally get a great deal of enjoyment out of going into stealth mode with my small, extremely squishy Corvette, flying right up to something like a Dreadnought – anything big is good – before launching my mines and bombarding them with my cannons. If it doesn’t look like I’m going to be able to finish them off, then I just boost out of there using my afterburners. There’s something very reassuring about being able to clean up in a match even if you’re playing a wee, incredibly vulnerable vessel and taking on leviathans. Head-on, I get cut to ribbons in seconds, but the risk just makes it more fun. And on those occasions where I bite off more than I can chew, I just have to hope that there’s a support ship mucking about nearby that can repair me. I don’t want to give the impression that Dreadnought is all about personal glory, or taking risks so you can add another kill to your list, though. That doesn’t win battles. Every ship has big, glaring weaknesses, and only when a team uses their abilities in tandem is victory assured. Communication is no doubt going to become important, but it looks like the small number of players with early access to the beta are all extremely shy. It’s a shame, because the size of the maps and speed with which ships can get torn apart necessitates a sort of situational awareness that’s really difficult to nail down without other players feeding you intelligence. Of the maps currently available, I’ve been surprised to find myself preferring the planet-based ones. Sure, the space battles seem thematically more appropriate, but when fighting closer to the ground, the limitations make things more interesting. There’s more cover, but also more obstacles that must be navigated when you’re fleeing or chasing, including the ground itself. And all of the maps – space and ground – are designed in such a way that there are plenty of ways to surprise an enemy or be surprised, offering so many attack routes and lofty pieces of cover that can be exited above, below or to the sides. Right now, they’re just straightforward battlefields where the objective is merely kill the opposing team. In a beta, it makes sense, as Yager are no doubt attempting to perfect the core combat, but more objective-based modes would really play to the strengths of the diverse array of ships and class roles. In particular, some sort of base defence mode would be a very welcome addition. Ships already have access to things like proximity mines and stealth, both of which would be incredibly handy when attempting to attack or defend a space station. 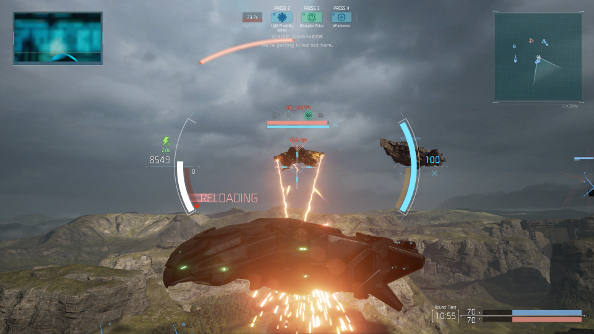 It took me a few matches to really gel with Dreadnought’s way of doing things. I was dreaming of fights in open space, titanic battlelines, and huge ships endlessly launching broadside attacks, attempting to smash through stalwart enemy defences. These things can happen, but there’s just as much of a conventional multiplayer shooter here, with cover and distinct but recognisable roles. The extra dimension created by being in space – or at least in the skies above a planet – subverts some of these conventions, though. Attacks can come from anywhere, ships can strike at you from any angle, and every piece of cover, every safe haven, is incredibly fleeting. 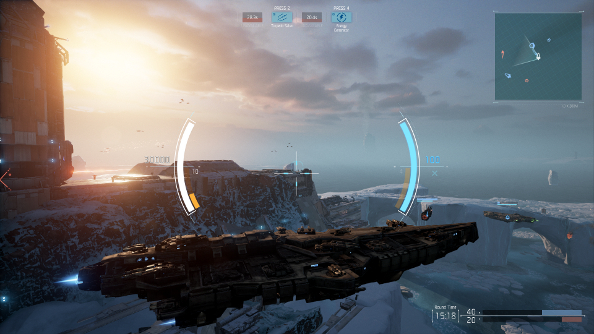 Dreadnought’s beta is live now and the Dreadnaught release date is sometime in 2016.